At the conclusion of the First World War, the United States entered into a series of discussions on armaments culminating in the Washington Arms Limitations Conference of 1921--22. At the conclusion of these talks, the United States government agreed to sign a number of treaties limiting the size of the navy and suspending construction of new warships for a period of ten years. Among other things, an agreement was reached with Great Britain and Japan, the only great naval powers left after the Great War, to limit the tonnage of the capital ships in their respective navies by a ratio of 5:5:3, with Japan restricted to the smaller amount. Other "treaty limitations" adopted by the powers restricted the maximum displacement of battleships to 35,000 tons, prohibited guns larger than sixteen inches, and set limitations on carrier tonnage. Japan, which had taken over Germany's possessions in the central Pacific,1 was now perceived as a major threat to the United States and the country with which war was most likely. With this change, U.S. naval thinking shifted from the problems of the Atlantic to a strategy that would have to contend with the vast expanse of the Pacific Ocean. Accordingly, elements of the Atlantic and Pacific Fleets were soon merged into a single U.S. Fleet and moved to the West Coast. Throughout the interwar period, contingency planning for war in the United States was based on a number of formal war plans developed by the Joint Army-Navy Board. The Joint Board, as it was frequently called, was composed of senior officers of the army and navy who were responsible for coordinating the war plans of both services. For the navy, these officers were the chief of naval operations, the assistant chief of naval operations, and the director of the War Plans Division. Britain, black for Germany, orange for Japan, and so on. Since orange was the code for Japan, the plan developed in case of war with Japan was named War Plan ORANGE. 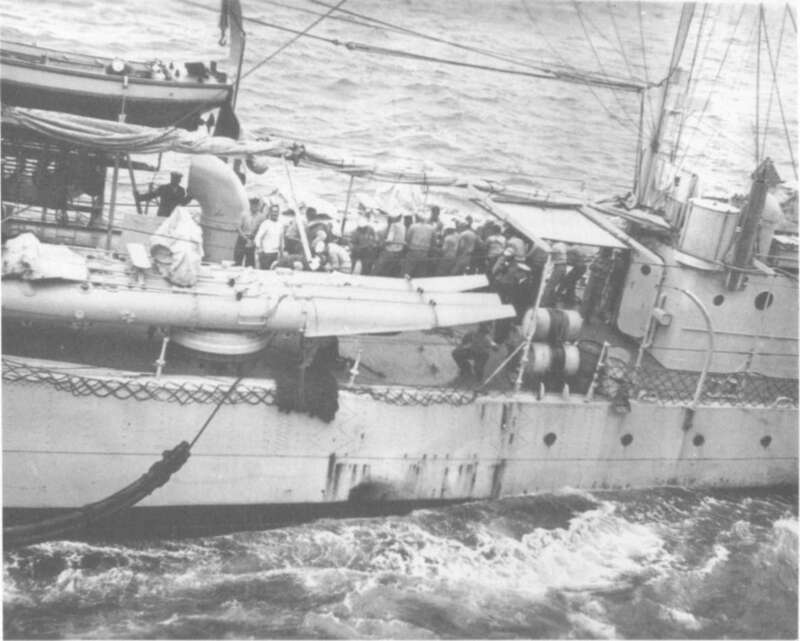 "ORANGE" quickly became the centerpiece of the navy's strategy throughout the interwar period and was to greatly influence the tactics, weapons, and ship characteristics adopted to meet the needs of a war that was sure to be fought over immense distances between the forward bases projected for use in the Pacific. By the summer of 1924, the Joint Board had reached agreement on a basic strategy for ORANGE designed for a rapid advance across the Pacific, which Edward S. Miller, in his authoritative study War Plan Orange, has dubbed the "Through Ticket. "2 In the event of war with Japan, the main units of the U.S. Fleet would be dispatched to the Western Pacific where it was assumed the Asiatic Fleet would be fighting a holding action against the Japanese forces.3 Speed was an essential element of the plan if the Asiatic Fleet was to be rescued before the fall of the Philippines. Although the exact details of War Plan ORANGE were frequently modified and revised during the decade of the 1920s, its basic concept remained unchanged: major units of the fleet would be quickly formed into a fighting unit and sent to the Western Pacific. Upon mobilization, the main forces of the U.S. Fleet would be concentrated in Hawaiian waters, then dispatched across the Pacific to establish an advance base or bases from which offensive operations could be mounted against Japan. The planners assumed, with some certainty, that Pearl Harbor, the Hawaiian and Midway chains, and the inner Aleutian Islands would remain in American hands. Holding the Philippines, Wake, and Guam was more questionable. Much of the planning for ORANGE concerned the buildup of sufficient fleet units and air support in these forward areas. In most versions of the plan, the logistic forces required to support the fleet were to follow in a supply "Train" (a corporate entity of the U.S. Fleet) made up of troop transports, cargo vessels, ammunition ships, oilers, hospital ships, and tugs. Even the need to supply floating dry docks was foreseen by the planners. The Train was scheduled to transport the expeditionary force and would carry all the replacement personnel and aircraft needed to establish the forward bases that were to be acquired to support fleet operations in the Western Pacific. SOURCE: Extracted from E. Miller, War Plan Orange, 128.
event of war.4 As for the fleet, the eighteen navy oilers built or acquired just after World War I were thought sufficient for its immediate needs. 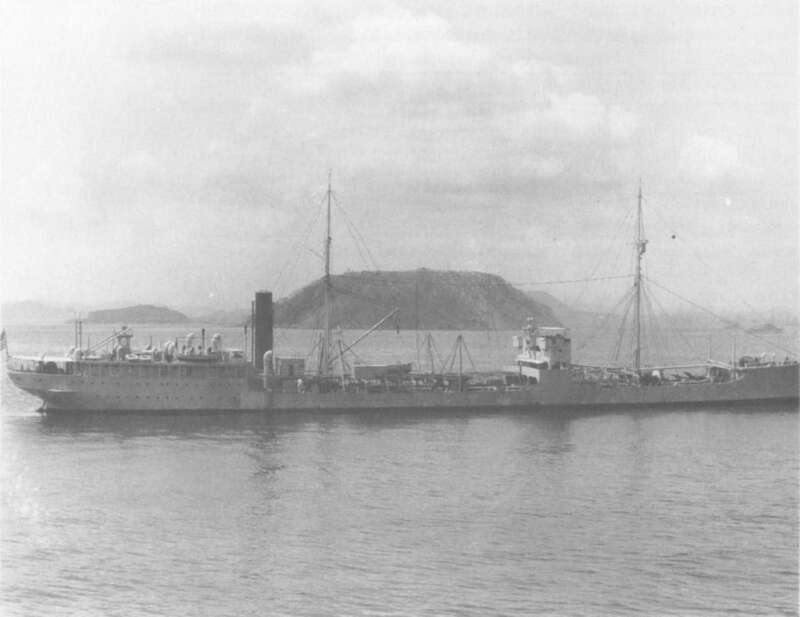 By the late 1920s, the plans for ORANGE had evolved into an immense undertaking involving hundreds of ships, which would steam across the Pacific to an advance base to be quickly established in the Philippines.5 Hawaii was to be the jumping-off point for the fleet, which was to sortie from the islands at thirty-day intervals. The timetable for this elaborate scheme showed that it would take the battle force, the first wave to depart, twenty days to reach its objective at a projected speed of 10 knots--the fastest that could be maintained by all of the ships in the armada during the 4,800-mile cruise. 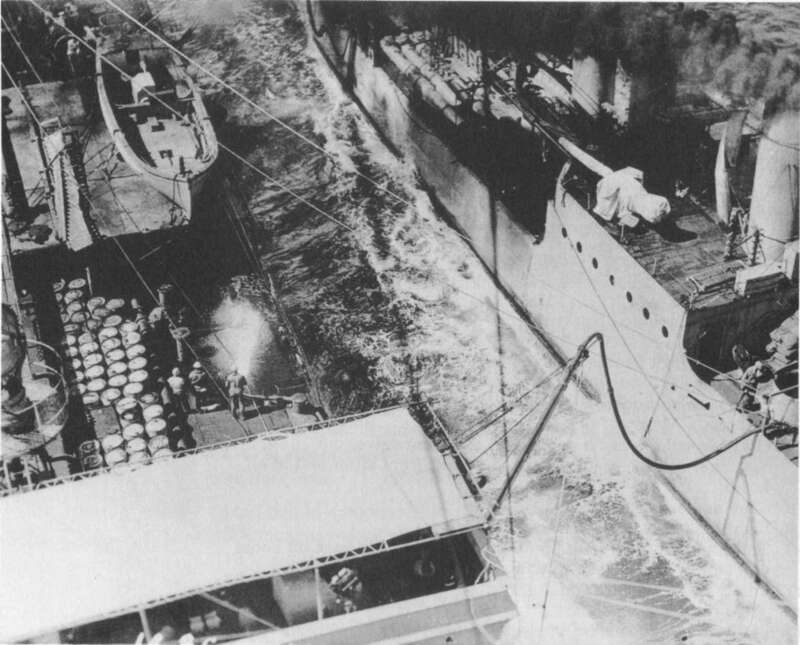 Since none of the minor combatants or small auxiliaries scheduled to accompany the fleet had the required range to cross the Pacific without replenishment along the way, fueling enroute was an obvious necessity.6 Fortunately for the U.S. Navy, it had continued to develop this important concept throughout the 1920s. Steaming as before alongside CUYAMA with riding line of two parts 10" manila, and bow and stern breast of 8" manila. CUYAMA speed 4 knots, own speed 1 knot on course 110° p.g.c. 110° true. Boilers #10, #11 and #12 in use. Receiving fuel oil over two 4" fuel lines. At 1:20 connected up third 4" fuel line. Average steam 250. Average Revolutions 19.9.
demonstrated during this operation would have fulfilled the at-sea fueling requirements of large capital ships. 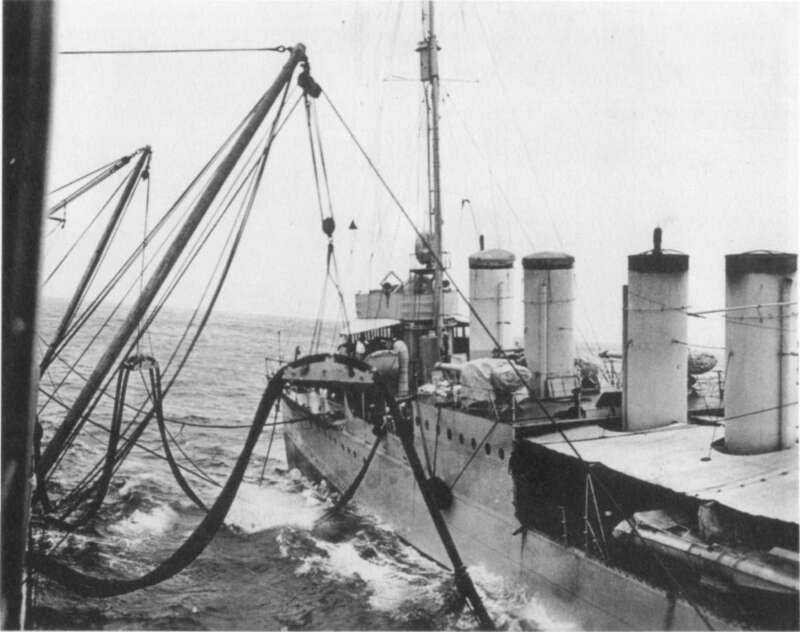 Testing Kanawha's towing gear (as requested by Admiral Eberle) did not begin until December 1924, when the Kanawha transferred 29,186 gallons of fuel oil via the over-the-stern method to the Arizona in smooth seas.11 A second series of tests was conducted on 23 May 1925 to evaluate the performance of a new type of tension engine installed on the Kanawha. 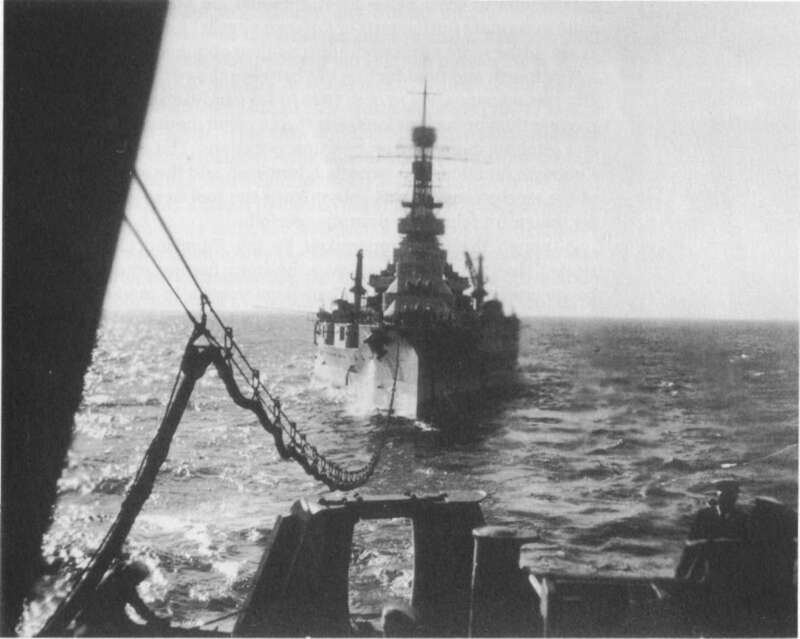 Once again, the Kanawha attempted to fuel the Arizona while both vessels were under way, but the exercise was discontinued after the fuel hose between the two ships ruptured.12 No attempt was made to reconnect the hose, since sufficient data had already been obtained concerning performance of the tension engine. 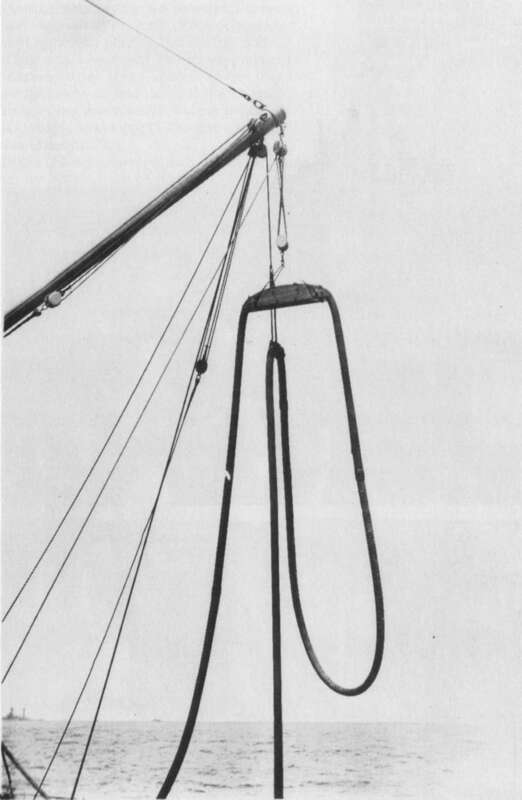 The saddle arrangement was used by Cuyama in the mid-1920s to support the fuel hose while fueling at sea. 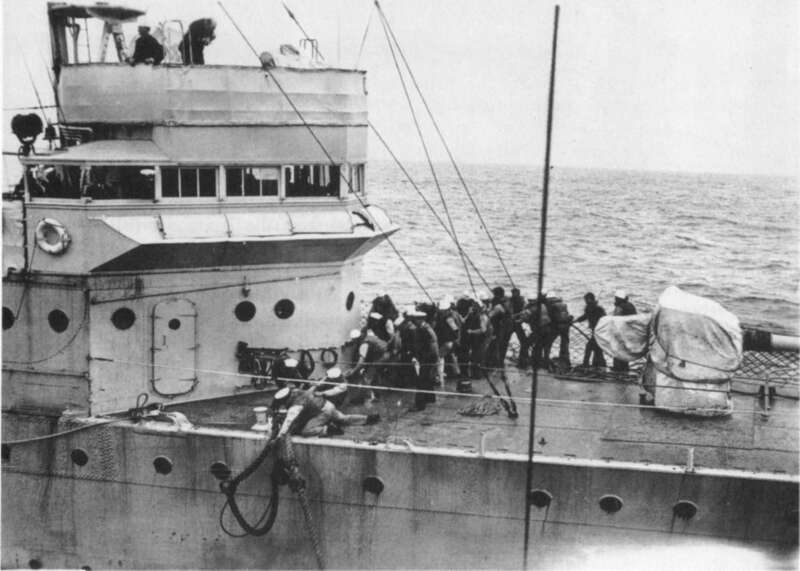 The fourth and final fueling test between the two ships was eventually carried out on 31 October 1926 in sea conditions that were slightly rougher than in the previous tests.18 As a result, both ships were rolling and pitching more than on previous occasions. 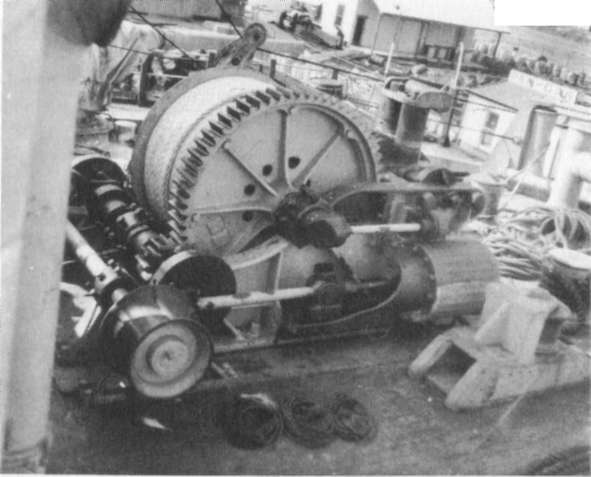 The gear on board the Kanawha functioned as expected, however, and the automatic feature of the tension engine was able to keep the fuel hose above the water for the entire four-hour pumping period. the development of fueling at sea gear is desirable not only for the shorter radius battleships but for other types larger than destroyers--including light cruisers, on which experience indicates the desirability of astern fueling in cases where fueling alongside is impossible or hazardous. The foregoing is of particular interest not only because it provides technical insights into the problems of refueling at sea, but more so because it demonstrates the administrative workings within the Navy Department and the potential for political rivalry inherent in the bureau system. Rear Admiral Rock adroitly exploited his technical expertise to placate the director of war plans while obtaining the policy decision desired by his bureau. The author believes that the high level of technical competence and administrative excellence demonstrated by Admiral Rock was typical of those within the officer corps who had risen to high administrative position. To achieve such status, a naval officer had to prove his technical competency while exercising the political acumen needed for continued favor within the department. While promotion within the department appears to have been based on merit, the best billets (i.e., those that would lead to the greatest opportunities) were greatly influenced by the patronage and influence of those officers who were in a position to recommend or suggest appointments to the chief of the Bureau of Navigation, the chief of naval operations, or the secretary of the navy. Diplomacy and/ or the ability to cultivate friendships appears to have been an essential attribute of those officers who achieved flag rank. 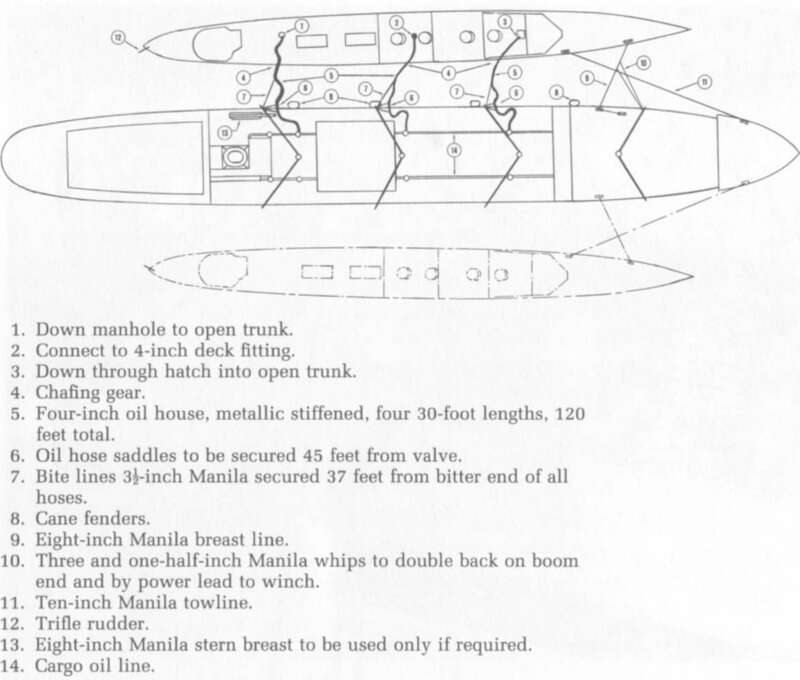 SOURCE: "The Problem of Refueling an Overseas Expedition," File S1-S68, SecNav SC-files, RG 80, NA. 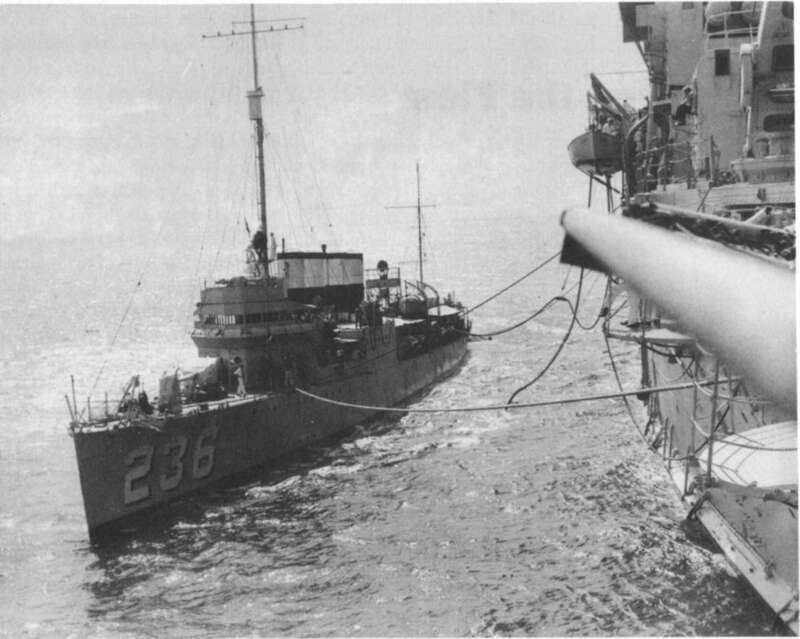 The destroyer Perry takes fuel from Arizona while participating in the fleet exercises of 1932. In its report on the problem of refueling at sea, war plans made a number of recommendations that were to have a major impact on the operational development of this important innovation in fleet logistics. Fleet Problem XIII. The crew of a destroyer takes in the 10-inch towing line in preparation for fueling at sea. 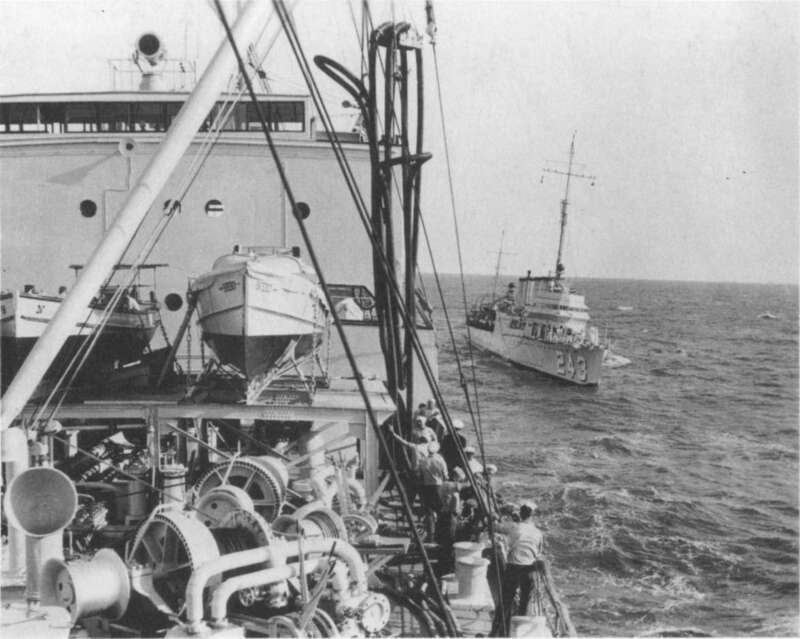 A pair of 4-inch fuel hoses are being hauled aboard an unidentified destroyer during fueling-at-sea exercises circa 1932. Plans for fueling destroyers from the Tennessee (BB-43) and the West Virginia (BB-48) were soon drawn up by the Bureau of Construction and Repair with the suggestion that a test be conducted at sea "to determine definitely the gear required under actual operating conditions. 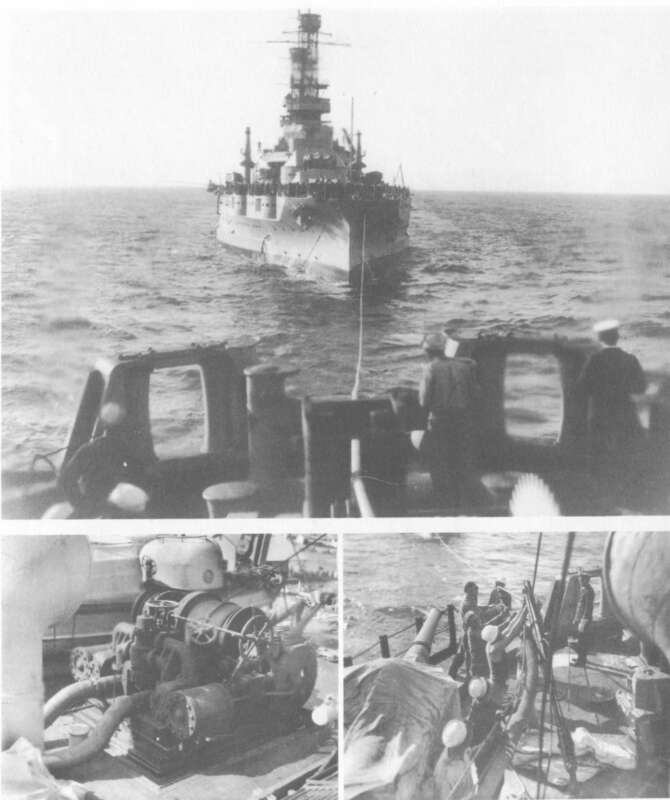 "36 Although documents describing the planned tests have not been located, it is clear from the photograph of the Perry taking fuel from the Arizona (see page 39) that fueling destroyers from battleships was readily accomplished. To increase the fuel transfer rate, Brazos (shown here) could deploy as many as four 4-inch hoses on one side. 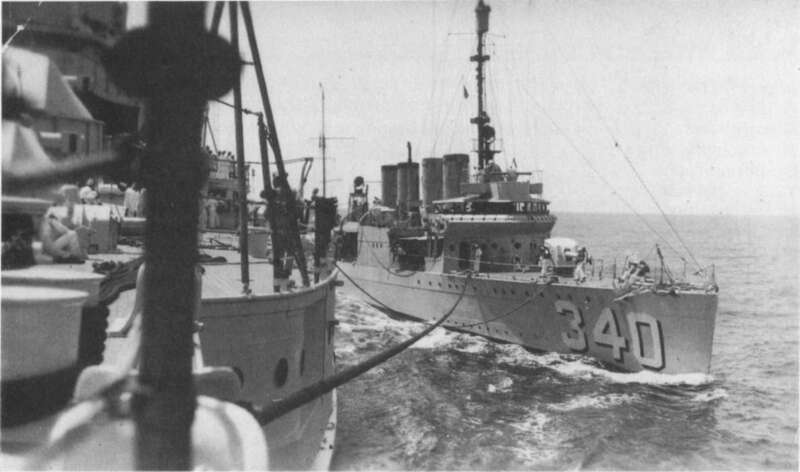 held in the fall of 1934 and again during Fleet Problem XVI with favorable results.39 Adm. Joseph M. Reeves considered the successful implementation of fueling destroyers at sea important enough to warrant its mention in his annual report as commander in chief of the U.S. Fleet for fiscal year 1935, although he made sure to qualify its usefulness by stating that it was still "attended by considerable danger of damage under any but ideal conditions. "40 It appears that this attitude prevailed throughout the fleet during the mid-1930s and seems certainly to have contributed to the reluctance to develop a better means of refueling large vessels under way.